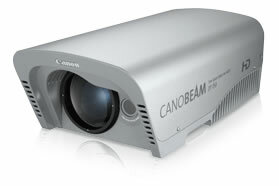 Combining its optical and IT expertise, Canon has developed the CANOBEAM DT-50, a device for wireless digital data transmission between two points as far as two kilometers apart. The system supports a wide range of transmission speeds from 25Mb/s to 622Mb/s - fast enough for most common network traffic. Using the latest laser technology and Canon's optical experience enables the system to work at the same speed as optical fibre cables while avoiding the costs of laying cables. 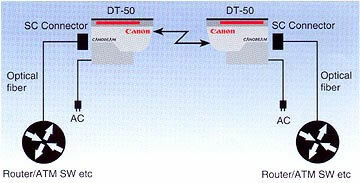 Canon expects that the CANOBEAM DT-50 will appeal to network managers operating LANs over a number of buildings, such as a hospital or university complex or facility with both office and manufacturing buildings. Optical technology means that the Canobeam DT-50 is interference free, reliable and confidential transmission is assured. Engineered for maximum safety, is is easyto use and to install. Installation requires two units to be placed with an unobstructed view of each other. The system supports a wide range of transmission speeds from 25 Mbps to 622 Mbps â€“ fast enough for most common network traffic. Costs of the system are limited to the initial investment, which is likely to be substantially less than laying optical fibres, and running costs limited to minor electricity and maintenance fees. Advanced Canon auto-tracking technology ensures the network link is maintained even in adverse weather conditions that causes movement to buildings. Movement in the optical axis is detected and compensated for up to 4 degrees, both horizontally and vertically. Status monitoring is made simple for network managers with device management software that is easily installed. CANOBEAM DT-50 also supports SNMP (Simple Network Management Protocol), an effective tool for managing a network composed of equipment from a variety of vendors. SNMP is an additional cost option. For transmission over 2km or for buildings without a direct line of sight between them, a 3R function (not available with the DT-50/DT-IFFM1 25 â€“ 156Mb/s bit rates free system) enables relay transmissions without any loss of signal quality.